Route 1 south – jug handle at New Road – cross over Route 1 – go to first traffic light make a left onto Route 522 (East). Go through 1 traffic light (Ridge Rd) stay in right lane – entrance to Monmouth Walk is the 1st right. Route 1 north – to Route 522 (East) – Go through 2 traffic lights (New Rd, Ridge Rd) stay in right lane – entrance to Monmouth Walk is the 1st right. Take NJ Turnpike to Exit 8A. Make a left turn on to Cranbury-South River Rd. At light, make a right turn on to Forsgate Drive. At next light/intersection, this is Route 130, make a right, going north. Take the first left, which is Georges Road. Follow this to the first light, which is Rte 522 (West), and make a left turn at this light. 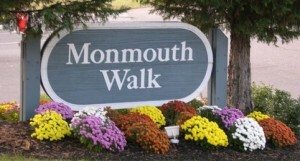 Take the first jug handle on your right and make a left at the light which puts you on Rte 522 (East), stay in right lane – entrance to Monmouth Walk is the 1st right.